We will customize its width of RAM and shut height by your order for your new press. The frame is a one-piece, stress-relieved casting with the sides extendedat the rear in box-form sections, which are utilised as air receivers. 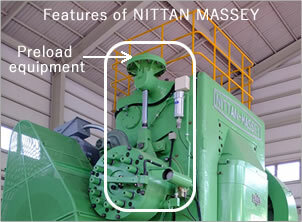 Air piping for the clutch and brake systems is thus kept to a minimum,avoiding unnecessary air losses. 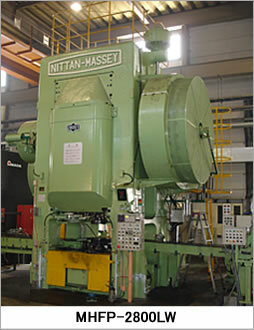 The casting is subjected to a rigorous code of inspection at all stages of production using the most modern methods. All bearing surfaces are machined and machined and protected by replaceable bushes or liners. The base is also machined to ensure a good bed on the foundation. For a given weight of frame the one-piece design has the shortest possible elastic circuit and provides the maximum effective cross-sectional area between the eccentric shaft bearings and the table. Dynamic balancing of the ram and connecting rod assembly is effected by air cylinders, which automatically counterbalance the ram so that contact is maintained between the bearing surfaces throughout the working stroke. Static balancing is sufficient when ‘inching’ or slow running but dynamic balancing is required to maintain contact at high speed when approximately double the balancing forces are needed. flash thickness can be reduced to a minimum without die to die contact. 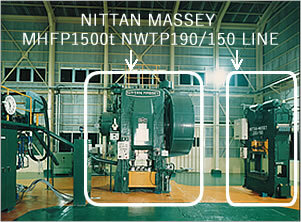 heat transfer from the forging to the top die is reduced. impact of the eccentric shaft on its bearings is eliminated and bearig wear is, therefore, reduced. shock to the roller bearings of the clutch assembly is reduced to a minimum.